Safety Appreciation Lunch at St. Francis of Assisi School!! 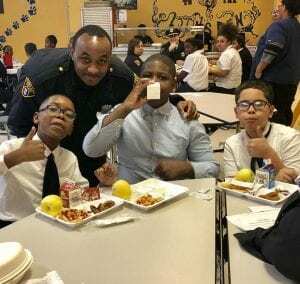 Cleveland Police from Community Policing and the Fifth District joined other safety force personnel at St. Francis School on Myron Avenue on Cleveland’s East Side for an appreciation day lunch with the students and staff. All of the officers had a great time sharing a meal with the kids and getting to know them. The leadership of this school, under Principal Scott Embacher and Assistant Principal Carrie Grace is quite impressive. Every officer was met at the door with a firm handshake and thank you, then led on a tour of the school, followed by lunch, with another thank you and handshake upon leaving. These youths are in great hands!! Thank you to the St Francis students and staff for a wonderful day! !